Mix part of the water, olive oil, and pressed garlic clove in a small bowl. 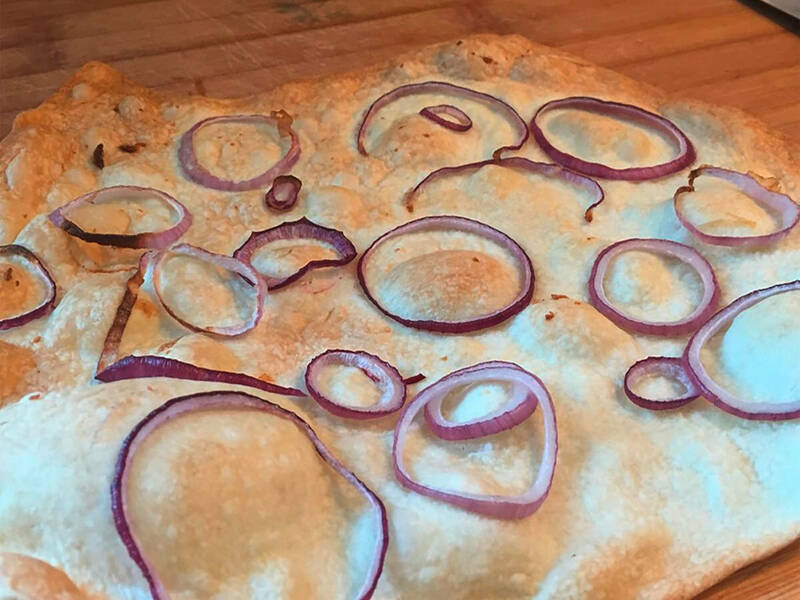 Cut red onions in rings. Mix remaining water and olive oil in a large bowl. Combine flour and salt in a smaller bowl. Then add the dry mixture to the wet mixture and knead until smooth. Cover the dough and set aside to rest for 5 min. Pull dough up on one side and press down in the center. Repeat this in a circular movement until the entire dough has been worked. Cover again and rest for 5 min. Repeat this step two times until dough is elastic. Divide dough into 4 equal-sized portions and roll out thinly. Transfer to parchment paper and roll out again. Rest for 10 min. Meanwhile, preheat the oven to 180°C/350°F (convection). Brush the rested flatbreads with garlic oil. Add onion rings and bake at 180°C/350°F (convection) for approx. 10 min. until golden.